WorldCPR Learning Centers LLC is a certified training site for the American Heart Association(AHA) and EMS Safety certifications, offering emergency cardiovascular care programs (ECC) to health care providers, workplace and community-based rescuers throughout Maryland, District of Columbia and Virginia. Our courses follow the latest guidelines and offer same-day certifications. All of our classes and certificates are valid for two years. Training is provided in traditional classroom setting, e-Learning online combo or onsite at your location. Current AHA or EMS textbooks are required for all courses. If you already own a textbook, you will not be charged but you will be required to bring it to the class. Is EMS Safety equivalent to the American Heart Association and American Red Cross? Yes, EMS Safety is an equivalent program to the American Heart Association and American Red Cross. EMS follow the same guidelines set forth by the International Liaison Committee on Resuscitation (ILCOR). The American Heart Association (AHA) is the nation’s oldest and largest voluntary organization dedicated to fighting heart disease and stroke. AHA funds cardiovascular medical research, educates consumers on healthy living and fosters appropriate cardiac care in an effort to reduce disability and deaths caused by cardiovascular disease and stroke. The American Heart Association’s BLS Healthcare Provider Course provides many of today’s healthcare professionals the ability to determine life-threatening emergencies, utilize CPR and relieve choking in a safe and effective manner. If you work, plan on working or are a student in the healthcare field, generally you need a Healthcare Provider BLS card. The American Heart Association’s Heartsaver classes are for non-healthcare workers with limited or no medical training who need CPR/AED/First Aid certification for job or other requirements, or who would just like to learn in a fun and relaxed environment. If you DO NOT work in a Healthcare setting, a general Heartsaver CPR/AED will fulfill basic CPR requirements. EMS Safety is a nationally recognized program. EMS have more than 260 approvals from federal, state, local and private agencies in all 50 states and U.S. territories. All EMS Safety training programs are OSHA-compliant and have been reviewed and approved by federal, state, local and private organizations. EMS Safety offers a range of safety training programs and certifications tailored to specific audiences. The EMS Safety CPR, AED and First Aid for Community Rescuer programs are ideal for workplace and community responders. Courses include: CPR, AED and First Aid, CPR and AED and First Aid. The EMS Safety CPR, AED and First Aid for Childcare Providers program is ideal for childcare providers, parents and babysitters. Additional topics include: Indoor, Water and Playground Safety, Dehydration, Recognizing Maltreatment. The EMS Safety CPR, AED and First Aid for Caregivers program is ideal for personal caregivers, assisted living facility staff and active seniors. Additional topics include: Diabetes Management, Medication Safety, Fall Prevention and Fall Proofing. The EMS Safety BBP program is ideal for emergency responders and anyone with potential exposure to blood or body fluids. Topics include: Personal Protective Equipment (PPE), Hepatitis B and C Viruses, Workplace Transmission. The EMS Safety Emergency Oxygen Administration program is ideal for emergency responders and healthcare providers. Topics include: Oxygen Types and Uses, Oxygen Admin Devices and Risks, Oxygen Storage and Safety. If you are taking training to meet requirements or standards of any kind, please confirm with that organization that you are taking the correct course to meet their requirements. WorldCPR Learning Center, LLC is not responsible if you register and/or take the wrong course. Giving breaths using mouth-to-mouth, mouth-to-mask and bag-mask. Performing 1 and 2 rescuer CPR for adult, child and infant victims. Relieve choking in the responsive and unresponsive victim of any age. At the end of the course, students complete a skill examination and written test consisting of 25 multiple choice questions. 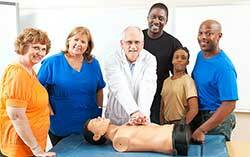 Students who need to renew their BLS certification must take the full BLS course. There is no separate course for BLS renewals. The Basic Life Support for the Healthcare Provider (BLS) course is recommended for anyone in the healthcare profession. The course is commonly required for physicians, nurses, paramedics, emergency medical technicians, respiratory therapists, physical and occupational therapists, physician assistants, chiropractors, dentists, and dental hygienists. In addition, medical residents and fellows, medical students, students of medical technology programs, certified nursing assistants, aides, and others who must have a credential (card) documenting successful completion of a healthcare provider-level CPR. Upon completion of the course students receive a BLS for Healthcare Providers course completion card that is valid for 2 years by the American Heart Association. In the classroom, students engage in simulated clinical scenarios and learning stations. Students work with an AHA BLS Instructor to complete BLS skills practice and skills testing. Students also complete a written exam. The Heartsaver CPR Course is designed to provide CPR training for designated helpers, individuals needing training for job or regulatory requirements and select departments or an entire workplace, this course is also for individuals just wanting to learn the life saving skills of CPR. You will learn how to recognize several life-threatening emergencies, provide CPR and relieve choking in a safe, timely and effective manner. Individual wanting to learn the lifesaving skills of CPR designated first responders, individuals needing credentialed training for job or regulatory requirements and select departments or an entire workplace. Upon completion of the course students receive Heartsaver CPR course completion card that is valid for two years by the American Heart Association. American Heart Association Heartsaver CPR Course Completion Card are valid for two years.In the classroom, students engage in simulated clinical scenarios and learning stations. Students work with an AHA instructor to complete their skills practice and skills testing. First Aid courses are structured for members of the community who may be called upon to provide care or assistance to community members, but do not work in the healthcare field. designed to Participants will learn how to recognize common medical emergencies, life-threatening emergencies, reach the 911 system, and provide critical, life-saving skills as well as basic first aid to a victim in need prior to the arrival of an ambulance. Successful performance of skills is required for completion card. There is no written examination. This Heartsaver First Aid training includes extensive hands-on practice. This course is for the general public, designated first responders, laypersons, teachers, coaches, fitness instructors, massage therapist, security officers, social workers, scouts, daycare, babysitters, lifeguards, construction, volunteers, transportation, engineers, corporate/government offices, and those requiring certification for their workplace. Upon completion of the course students receive Heartsaver First Aid course completion card that is valid for two years by the American Heart Association. Heartsaver CPR & AED course is designed to teach the participant to recognize life-threatening emergencies, access the 911 system, and provide critical life-saving interventions to a victim in need prior to the arrival of an ambulance. 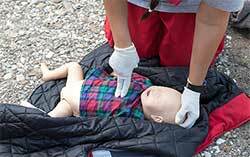 The course covers adult CPR and AED use, child CPR and AED use, and infant CPR. This training will also cover steps on how to help a choking victim, the signs and symptoms of a heart attack, stroke, recognizing an emergency, when to start Cardio Pulmonary Resuscitation (CPR), and other preventive measures. Heart saver students will also learn the proper use of an Automated External Defibrillator (AED). Upon completion of the course students receive Heartsaver CPR AED course completion card that is valid for two years by the American Heart Association. The Heartsaver First Aid with CPR and AED is a classroom course that is designed to meet OSHA requirements. The course teaches basic first Aid, CPR, and AED skills such as helping someone with a possible broken bone or sprain, heart attacks, strokes, burns and bites just to name a few. Also covers CPR to an infant, child, or an adult and using an Automated External Defibrillator (AED). Participants will learn how to recognize common medical emergencies, life-threatening emergencies, reach the 911 system, and provide critical, life-saving skills as well as basic first aid to a victim in need prior to the arrival of an ambulance. Upon completion of the course students receive Heartsaver CPR/ AED/First Aid course completion card that is valid for two years by the American Heart Association. The Heartsaver Pediatric First Aid CPR AED course is intended for child care workers, teachers, foster care workers, camp counselors, youth organizations, coaches for children’s sports organizations and others responsible for children including parents, grandparents, babysitters and guardians. Course Completion: Upon completion of the course students receive Heartsaver Pediatric First Aid CPR AED course completion card that is valid for two years by the American Heart Association. The Heartsaver Friends and Family CPR Course are designed to provide CPR training for individuals just wanting to learn the lifesaving skills of CPR. Prefect for new families or families with elderly relatives. You will learn how to recognize several life-threatening emergencies, provide CPR and relieve choking in a safe, timely and effective manner. Individual wanting to learn the lifesaving skills of CPR, designated first responders, individuals needing credentialed training for job or regulatory requirements and select departments or an entire workplace. The American Heart Association Heartsaver Friends and Family CPR Course Completion Card is valid for two years. In the classroom, students engage in simulated clinical scenarios and learning stations. Cards are given out at the conclusion of class. The Heartsaver Bloodborne Pathogens Course is a classroom course that teaches employees how to protect themselves and others from being exposed to blood or blood-containing materials. This class is designed to provide students with the essential knowledge necessary to help reduce or eliminate the occupational risk of bloodborne pathogens. The training program teaches the information every employee who has occupational exposure needs to know to avoid accidental exposure to potentially infectious materials and to manage an accidental exposure if one occurs. This course is designed to meet Occupational Safety and Health Administration (OSHA) requirements for bloodborne pathogens training when paired with site-specific instruction. The Heartsaver Bloodborne Pathogens is intended for workers in the commercial market who must receive training per OSHA Standard 1910.1030, and those with a reasonable chance of coming into contact with bloodborne pathogens such as correctional officers, childcare workers, security guards, maintenance workers, school personnel, hotel housekeepers, health and fitness club staff, industry and manufacturing, occupational health, property management and tattoo artists to name just a few. Course Completion: Upon completion of the course students receive Heartsaver Bloodborne Pathogen course completion card that is valid for two years by the American Heart Association. The BLS Healthcare Provider Skills Testing are for the individuals that have already completed the online part A portion through the American Heart Association. The skills testing is to test the practical parts of CPR. The course is intended for certified or noncertified, licensed or nonlicensed healthcare professionals. Healthcare providers such as physicians, nurses, paramedics, emergency medical technicians, respiratory therapists, physical and occupational therapists, physician’s assistants, CNA’s, residents or fellows, or medical or nursing students in training, aides, medical or nursing assistants, police officers, and other allied health personnel. The American Heart Association BLS for Healthcare Providers Course Completion Card are valid for two years. In the classroom, students work with an AHA BLS Instructor to complete BLS skills practice and skills testing. Skills Exam: Required for completion card. The First Aid is a course that teaches students critical skills needed to respond to and manage a First Aid, choking or sudden cardiac arrest emergency in the first few minutes until emergency medical services (EMS) arrives. Students learn skills such as how to treat bleeding, sprains, broken bones, shock and other first aid emergencies. This First Aid training includes extensive hands-on practice. Community, Workplace, School, Citizen Rescuers. Upon completion of the course students receive First Aid course completion card that is valid for two years. The CPR and AED certification course teaches how to recognize cardiac arrest, activate emergency medical services, and respond appropriately until additional assistance arrives. It also covers how to respond to urgent choking situations, adult and child CPR, AED use, infant CPR, and how to relieve choking in adults, children, and infants. This training program may be taught separately or as part of a comprehensive safety course. This training includes extensive hands-on practice. Upon completion of the course students receive CPR/ AED course completion card that is valid for two years. The First Aid, AED, and CPR training course builds the skills and confidence to respond to the most typical life-threatening emergencies. Ideal for those seeking a comprehensive emergency care class. Upon completion of the course students receive CPR/ AED/First Aid course completion card that is valid for two years. The First Aid, AED, and CPR training course builds the skills and confidence to respond to the most typical life-threatening emergencies. Ideal for those seeking a comprehensive emergency care class. This comprehensive program will help employers meet OSHA and other federal and state regulatory requirements for training employees how to respond and care for medical emergencies at work. The First Aid, AED, and CPR training course builds the skills and confidence to respond to the most typical life-threatening emergencies. Ideal for those seeking a comprehensive emergency care class. This course also includes fundamental information in babysitting, including proper supervision, basic caregiving skills and safety and injury prevention. Childcare Providers, Teachers, Coaches, Parents. Upon completion of the course students course completion card that is valid for two years. There is a required written test and skill testing for this class. The CPR, AED and First Aid for Caregivers training course builds the skills and confidence in healthcare providers to respond to the most typical life-threatening emergencies. The course contains all the same content from our CPR, AED and First Aid CORE program plus in-depth material on prevention of falls, medication management, staying active and more!. Seniors, Caregivers, Employees who work in Mental Health, Home-Based Care, and Skilled Nursing. Upon completion of the course students receive course completion card that is valid for two years. The Basic Life Support (BLS) course trains healthcare providers and professional responders how to recognize a life-threatening emergency, how to provide basic life support, and what to do in case of an airway obstruction or choking. Doctors, Nurses, Ancillary Healthcare Providers, Chiropractors, Dentists, Dental Hygienists, Paramedics, EMTs, Public Safety Personnel. Upon completion of the course students receive BLS course completion card that is valid for two years. The Bloodborne Pathogens (BBP) Awareness Training is an OSHA mandated training program for any person who may be reasonably anticipated to face contact with blood and other potentially infectious materials as the result of performing their job duties. BBP Awareness knowledge is for individuals who must comply with OSHA standard 29 CFR 1910.1030. This course is aimed specifically at those in the healthcare industry. For employees whose job or certain duties were identified to have potential exposure to BBP. Upon completion of the course students receive BBP Awareness course completion card that is valid for one year. The Emergency Oxygen Administration course is designed to give an overview of the safe and effective administration of supplemental oxygen during emergency. Serious and life-threatening medical emergencies often cause oxygen to be depleted in the body leaving the victim at risk for shock. The Emergency Oxygen Administration course focuses on administering emergency oxygen to breathing and non-breathing persons, emergency oxygen delivery systems and integrating pulse oximetry. This training program may be taught separately or as part of a comprehensive safety course. Healthcare Provider, First Responder or Workplace Responder for sites that provide emergency oxygen.